As a recruiter, you are not only responsible for finding the right people, but also for marketing the opportunity correctly. In the recruiting industry, marketing first begins with the job description. 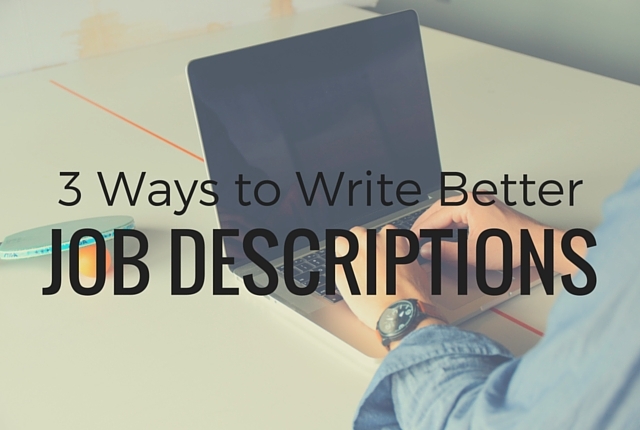 Yes, you could always simply post the description that the client has sent, but quite often there are pieces of information missing in those job descriptions. When you receive a new job order from a client, there are several steps that you must take before creating and posting a job description. If your primary contact with your client is an HR manager, you are not talking to the right person. In order to recruit the best talent for your client, you need to be in touch with the person in charge of hiring for the position. Get in touch with the hiring manager and you will be surprised how his expectations differ from the job description you were emailed. When you have the hiring manager’s ear, it is important that you ask the right questions in order to get a clear understanding of the skills and requirements needed for the job. Ask about previous hires and what made them successful. Ask your hiring manager to imagine that he hires the perfect fit for the job and that person has become a great success. Tell him to visualize that he is walking through the office with this hire a year later. What specifically did that hire do in the first year that made him successful? This is important information that will help you find the right talent and get closer to making a successful placement with your client. Be sure to take thorough notes during your conversation with the hiring manager. 3. Make it easy to read. Once you have gathered clear details from the hiring manager regarding skills and requirements, it’s time to put together the job description. It’s important to review the notes from your conversation with the hiring manager and condense them into simple but concise skills and requirements needed for the job. You will want your job description to be easy for the right talent to read and understand, so it’s best to keep it clean with bullet points under each individual section of skills and requirements. Of course, if you want to attract the attention of top talent you will want to make your job description snazzy and eye-catching. Don’t get too caught up in this part of the job description early on. Make sure that you have your key content for skills and requirements down before getting too creative. You can always go back and make changes as needed. Don’t be afraid to use colors or designs to attract talent. Get creative and have fun. What are some other tips for accurately defining skills and requirements in a job description? Please share your tips in the comments below.